Come to Caripe in Monagas State any time during November, December or January and you'll find coffee beans laid out to dry wherever there's a flat surface, even on the roads. 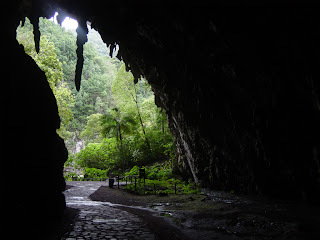 But it's not the local java that brings tourists to the high cool valleys of Caripe but the strange and wonderful nocturnal oilbirds that inhabit the dark recesses of a spectacular local cave, La Cueva del Guacharo. The Guacharo Cave is one of those Venezuelan musts - like a fly-over Angel Falls or a few days in the "Blue Lagoon" paradise of Los Roques - although few people make the four-hour drive from Cumana to see it. As the light begins to fade and darkness shrouds the gaping maw of the cave's entrance, the cacophony of clicks, squawks and shrieks from deep within starts to gather momentum and rise in volume. At first only a few flickering shadows emerge into the half-light, adding an air of mystery and suspense to this nightly ritual. Soon, they are followed by a fast-moving, shimmer of black as thousands of oilbirds leave the cave en masse, taking to the sky and spreading out over the forested hills. This is an event you can experience in few places in the world. Oilbirds are found in caves in Peru, Colombia, Ecuador, Bolivia and Trinidad, but none are as impressive as the Cueva del Guacharo, where the greatest concentration of oilbirds is found. Never seen in the sunlight, the thousands of birds that live in the cave only venture out at dusk, when the hills come alive with the squawks of Guacharos. Misinformation about the oilbird abounds. It was once believed that the birds would leave the cave and fly to Brazil to feed on the fruits of palm trees, although scientists have now proved that the 32 varieties of fruits and nuts the birds feed on are found within a 50km radius of the cave. The locals obviously still prefer the Brazil theory, given how many people have told us the story today - "Brazil? Oh further, uuuf, much further", one guy reckoned. Although we share the experience with a dozen or so Venezuelans, a couple of British birdwatchers and a German tourist, there's still a sense of privilege as we watch the birds emerge, a sense that we are seeing firsthand something that most people will only see in a wildlife documentary - if one exists. German explorer and naturalist Alexander von Humboldt saw a very similar sight on 18 September 1799. There were no roads back then so he and his faithful companion Aimee Bonpland were led through dense forests by a group of Chaima Indians from the local Franciscan mission. Humboldt's awe was all the greater for finding such a remarkable cave in this remote spot. Humboldt set out to find the lair of these whiskered, reddish-brown creatures after hearing fantastic tales of birds that lived in the dark like bats and ate only fruit. He was as astonished by the screeching cries of the birds as visitors are today. In ancient Castilian the word "Guacharo" means "one who wails or laments" and anybody entering the vast entrance to the cave soon founds out how apt a name it is for these odd birds. 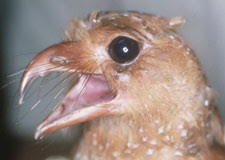 The noise serves a function, as Humboldt discovered, for the oilbird is the only bird that can fly freely in total darkness as the audible clicks, created by clacking its beak, are used for echolocation like bats. 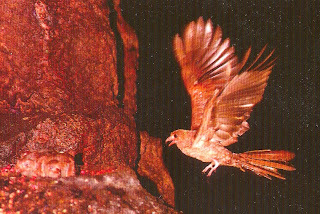 The "clicks", emitted at an incredible 250 a second, allow the oilbird to manouevre at high speed through the cave and a highly specialized sense of smell allows it to find the fruits and nuts that make up its diet. During his visit, Humboldt carried out the first scientific study of this unique bird and gave it the Latin name Steatornis caripensis, which means rather charmingly "fat bird of Caripe". Humboldt also investigated the significance of the cave to the local Chaima Indians: "The natives connect mystic ideas with this cave, inhabited by nocturnal birds," Humboldt wrote in his seven-volume account: "Personal Narrative of Travels to the Equinoctial Regions of the New Continent during the years 1799-1804"
"The magicians (piaches) and poisoners (imorons) perform their nocturnal tricks at the entrance of the cavern to conjure the chief of the evil spirits (Ivoriokiamo)... The Grotto of Caripe is the Tartarus of the Greeks; and the Guacharos... the Stygian birds." "To go and join the guacharos is with them a phrase signifying to rejoin their fathers, to die," Humboldt wrote, "they believe that the souls of their ancestors sojourn in the deep recesses of the cavern." "'Man', say they, 'should avoid places which are enlightened neither by the sun (Zis), nor by the moon (Nuna).'" Even today, the experience of entering the high-ceilinged, pitch-black chambers of the cave is a strange one. On my last visit, one boisterous six-year-old, ignoring his father's request to wait for the guide, ran off into the darkness only to return a few minutes later, spooked by the screeching birds. He clung to his father's leg and refused to move until he was persuaded by our guide that the birds wouldn't eat him. There are some 10,000 birds nesting on high ledges in the cave and the numbers generally increase in the nesting season from April to June. Harvesting of the young chicks has long been banned but it once provided a valuable source of oil for the Chaima who would use it for cooking and in lanterns. The young squabs accumulate large amounts of fat on their bodies in the first few months of life, sometimes weighing more than double that of an adult bird. To the Chaima the oilbirds represented both a valuable source of food and a link to the world of the spirits. Man and bird have lived in close contact since pre-Columbian times as the archaeological remains in the visitor's centre show. Chaima shamans would take hallucinogenic snuff and listen to the shrieks of the birds, believing they were the voices of the dead and that they could transmit prophecies of future events. Although passages reaching 10.2 kilometres into the mountain have been explored, only 1.5 kilometres are open to the public. 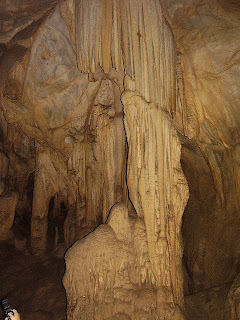 From the visitor's centre guided tours leave as soon as a party of ten is formed, taking about 30 minutes to get from the impressive stalactite-fringed cave entrance to the oddly-named "Room of the Breasts" (Salon de Los Pechos). Along the way, guides armed with flickering Coalman lamps point out the most spectacular formations of stalactites (coming down from the ceiling) and stalagmites (coming up from the floor), all of which have been named over the years. If you use you imagination - and squint your eyes a bit - close to the entrance you can make out a rock formation that vaguely lives up to its title of the "Virgen del Carmen". Further on you reach the long trunk and large ears of the "Cabeza de Elefante" (Elephant's Head) and the enormous cone of "La Torre" (The Tower). Along the way, as you follow the stream deeper into the cave, you meet lots of other wildlife. While the oilbirds natter on above your head, living on the mushy soil and nutty guano of the cave floor are loads of weird, stunted plants, unable to grow any higher in the darkness. In this strange terrain small rodents, such as the endemic spiny rat (Proechimys guyanensis), and centipedes, spiders and beetles feed off the fruit and seeds dropped by the birds. Finally, you reach the plaque that marks the spot where Humboldt's Indian guides refused to go farther and he was forced to return. For the Chaima Indians this entrance to the deeper chambers represented the entry to the world of the dead and anybody passing through it would never return. Luckily for my tour party the Indians were wrong. The only thing we experienced as we passed through the narrow passage into the "Hall of Silence" was a blissful deliverance from the clamour of the oilbirds. Back outside, as the night closed in and the oilbirds set out on their nightly forage for food, we set about finding a way back to Caripe. For some reason the bus service stops shortly after the park shuts at 4 p.m. even though one of the best parts of any visit is watching the birds leaving the cave at about 6:30 p.m. But even if we did miss the last bus back to town and ended up hitching a lift with some Venezuelan tourists, it was well worth it. I really enjoyed your tale. Well done! 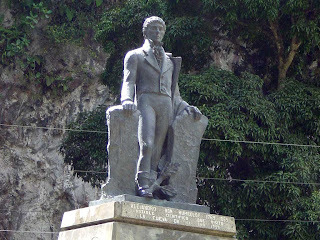 Awesome blog, I hadn't come across www.venezuelanodyssey.blogspot.com previously in my searches!